Last night I went to see the play ‘Wedlock of The Gods’ at the Cochrane theatre. It’s a play by Zulu Sofola who is Africa’s first female playwright. Up until my friend Debbie (hi Debs!) turned up at mine on Saturday with a promo flyer, I’d never heard of Zulu Sofola. The plot seemed interesting and I was curious about this Zulu Sofola person so last night I dragged my dear friend VeeVee to the show. If you live in London or are passing through this week, YOU HAVE TO GO SEE IT! I’ve copied in the synopsis from the Cochrane website for those of you that can’t be bothered to Google it. 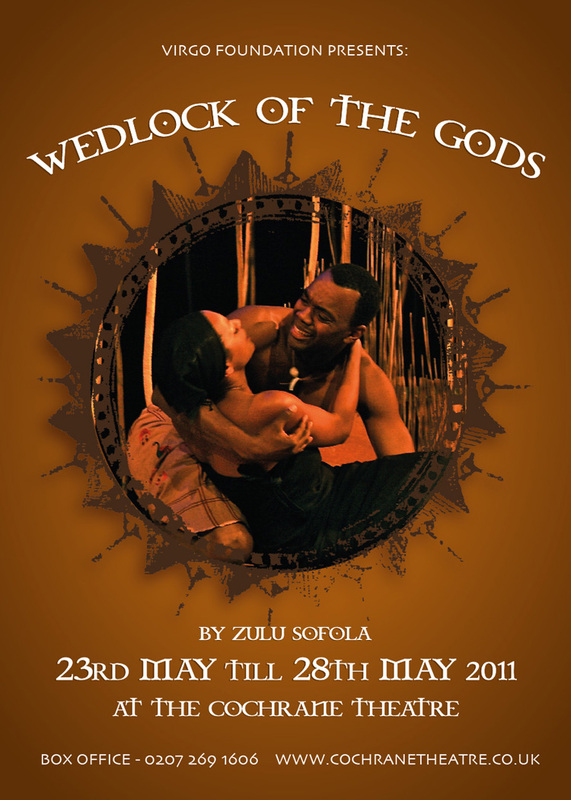 “Wedlock of the Gods is a tragic drama that has its roots in the ritual of death and mourning. A young girl is given away in marriage to a man whom she neither knows nor loves. Her parents are in desperate need of the dowry money to cure her sick brother. When the new husband dies unexpectedly events take on a new twist. Following in the custom of leviration the young girl is expected to mourn for three months and then marry her dead husband’s brother. The play is directed by Wale Ojo and features a cast of seasoned ‘Afro-Brit’ actors such as Ben Onwukwe (The Bill, London’s Burning), Chucky Venn (The Dark Knight, Borne Ultimatum), Maynard Eziashi (Mr Johnson, Ace Ventura, The Contract), Olufunke Adeleke, Moji Sorunke Bamtefa, Melanie Liburd, Golda John, Yetunde Oduwole, Reginald Ofodile and Wale Ojo. The cast were brilliantly hilarious as was the dialogue. I know, I know, I’m always going on about dialogue but seriously I’m fascinated by the stuff. It’s so so difficult to keep dialogue spunky, fresh and captivating but Sofola did a good job of it. Admittedly, the story is one that’s been told many times before and it has Romeo and Juliet written all over it but for me that didn’t really matter A good production is a good production is a good production. Tickets are £20 for adults but there are concession tickets at £10 for you students and senior citizens. The show is only on till Saturday the 28th of May, 2011 (this Saturday) so get your skates on if you’re interested! Seeing it tomorrow night. Yaaaaay! Didn’t you have to read it in JSS for literature along with “Lion and the Jewel”? Considering that not too long ago, you were talking about, “I love my culture, but it’s holding me back,” I can SEE WHY you like this play!!! Nice one I have read the play before and personally know one of the actresses Moji Bamtefa she’s good. Will see if I can make it. i saw it, wasn’t all that…just ok. Damn! I missed it. Hope to get another chance. Mrs Zulu Sofola was my choir mistress at the age of 10 🙂 at my Anglican church (yes, I was that good – sang soprano). The woman is an inspiration. Gond are those days that tradition has value. The play by Sofola,is a remarkable one…it is filled with suspense and tension..Although,it is a short play,it’s content are wonderful. The play is quite captivating.I love it!